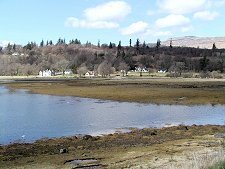 Strontian appears as a white-painted oasis on an inlet in the sea-loch, Loch Sunart. 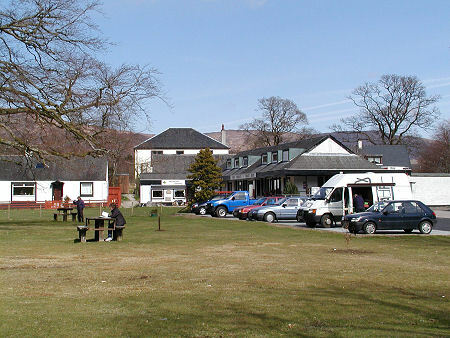 The main part of the village is fairly modern in appearance and is grouped around an attractive green. A northern arm, Scotstown, stretches north along the glen through which the Strontian River makes its way to sea. The name derives from the Gaelic for Point of the Fairies. The village is a local centre in an otherwise large and sparsely populated area of Western Scotland. It comes complete with a high school, shops, hotel, a petrol station, a Tourist Information Centre, and a caravan and camping site. 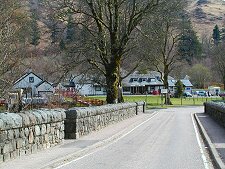 Hotels in the immediate area include the Kilcamb Lodge Hotel overlooking Loch Sunart to the west of the village and the Strontian Hotel on the east side of Strontian. Strontian was established in 1724 to provide accommodation for lead miners working in the galena ore mines. The mines reached their peak in 1730, when they employed 600 men extracting silver, lead and zinc, but then went into decline. In 1790, however, the lead mines were the cause of Strontian's unique claim to fame. French prisoners of war, who were working the mines to provide shot to assist the British war effort against France, found something else. This turned out the be a completely new element, later names Strontium after the village. The lead mines continued to be worked intermittently during the 1800s and first half of the 1900s. The last mining in the area, by this time extracting barite for use in the North Sea oilfields, took place in the 1980s. 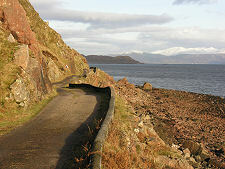 By 1820 Strontian lay on the road Thomas Telford had built to link Corran with Acharacle. 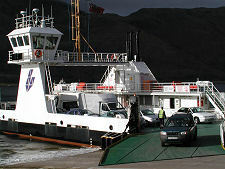 It also became a regular stopping point for steamers providing services to Tobermory on Mull. The village has one more footnote in history. In 1843, a local landowner refused permission to build a Free Presbyterian Church in the area. The congregation clubbed together to purchase a suitable vessel on Clydeside, had it converted into a church, and then towed it up the west coast of Scotland to a mooring nearby on Loch Sunart, where it became known as the Floating Church. This served the community until the 1870s. 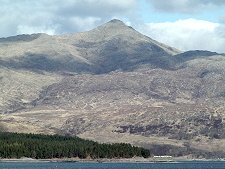 This area of Sunart is dominated by Beinn Resipol, whose 845m summit actually lies some way back from the few roads that exist. It is best seen from the road that runs from Acharacle west towards Kilchoan and the Ardnamurchan Peninsula. Strontian manages to combine a relaxed atmosphere and remote feel with a modern set of facilities. You may not find everything you want here, but you are very likely to find everything you need. Whether you are en-route from the Corran Ferry to the Lochaline to Fishnish Ferry to Mull; or working your way round to or from Ardnamurchan, Strontian is well worth a pause on your trip.